I really like the bookcases in our living room. They house all of our favorite old books, pictures, and of course random knick-knacks that make really great books ends. However today when I walked into the living room, I found something on my bookshelf that didn't belong. Can you spot it? It's my baby. 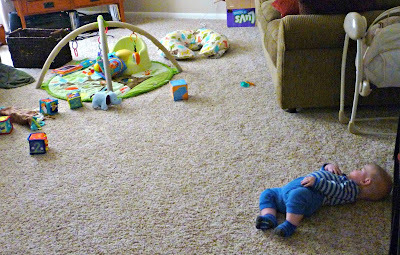 I laid him on the floor on the other side of the room surrounded by toys, and what does he do? 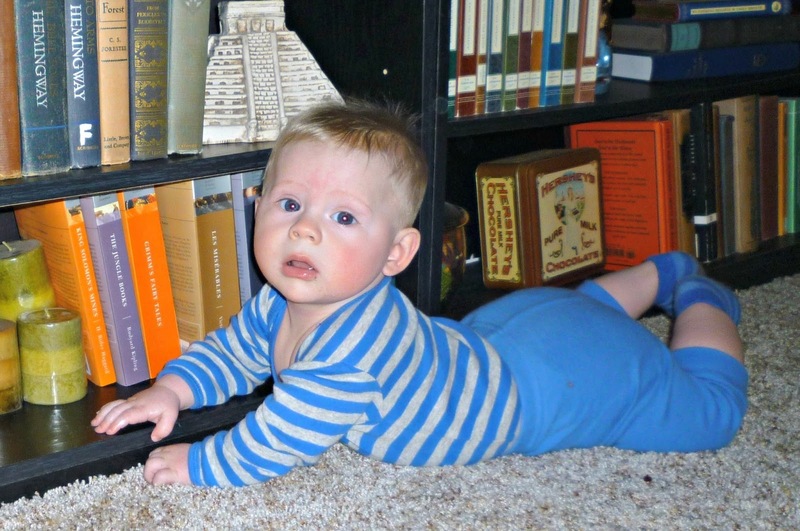 He rolls to the bookshelf to play with a candle. Lucky for him it's one of those decorative candles covered in plastic. Otherwise, he would've gotten a mouth full of wax. What did he say when I explained to him he wasn't allowed to play with things on the bookshelf? Absolutely nothing. Of course if I was this cute, I wouldn't bother defending myself either.